Kengo Kuma writes another important chapter in his career with Towada City Plaza, a civic and cultural centre built with the intention of using symbolic and sensitive architecture to repopulate the main streets in the city of Towada, in northern Japan. Kuma’s Towada City Plaza project promotes the principle of social life, represented in a clearly understandable form of architecture abounding in references, a visual memory of local landscape and therefore history. Kuma’s project follows another important project in the city by a big name in Japanese architecture, Ryue Nishizawa, who designed Towada Art Center in 2008. Both projects are part of a wider-ranging cultural plan to relaunch the city centre which the municipality of Towada is implementing in response to the phenomenon of emigration to the big cities, where there are more opportunities for work, education and personal development. Following delocalisation of numerous municipal offices, streets such as Kanchogaidori, the main road in Towada, have lost their landmark status. In view of the need to attract interest back to the historic parts of the city, Kuma studied its urban development and architectural types, and created Towada City Plaza to be another little town centre, simulating and alluding to the city’s streets and the characteristics of its homes. Its mission as a building for the community is evident in the message of the outlines of its four walls, which imitate a series of gabled roofs like those of the small homes in the area. This zig-zag outline accompanying the formal interpretation of the project on all sides appears again in the interior, creating an equally dynamic floor plan in which spaces are defined by diagonal walls, creating an asymmetric domestic landscape. Each room is separated from the others by floor-to-ceiling corridors leading to windows onto the outside, so that visitors inside the building feel as if they are in the centre of a town square. Kuma calls this feature the Michi-no-Hiroba (square for the street): roads lead off from it to a number of small volumes. This is the concept of microcosm within a macrocosm, of city within a city, which we have already encountered as a particular feature of contemporary Japanese architecture. The rooms/homes arranged around this “square” contain offices and multi-purpose rooms, a cooking workshop, a room completely covered with tatami, an exhibition area and two play areas, one larger and one smaller one set up as a nursery. Pictures of this part of the project are being posted all over the world: unlike the many playgrounds of coloured plastic in anonymous rounded shapes normally found in public facilities, Kuma’s playground offers children a natural landscape in which overlapping wooden shapes imitate differences in the lay of the land: wood completely covers the floor in the rooms, so that children feel as though they are playing freely out of doors. 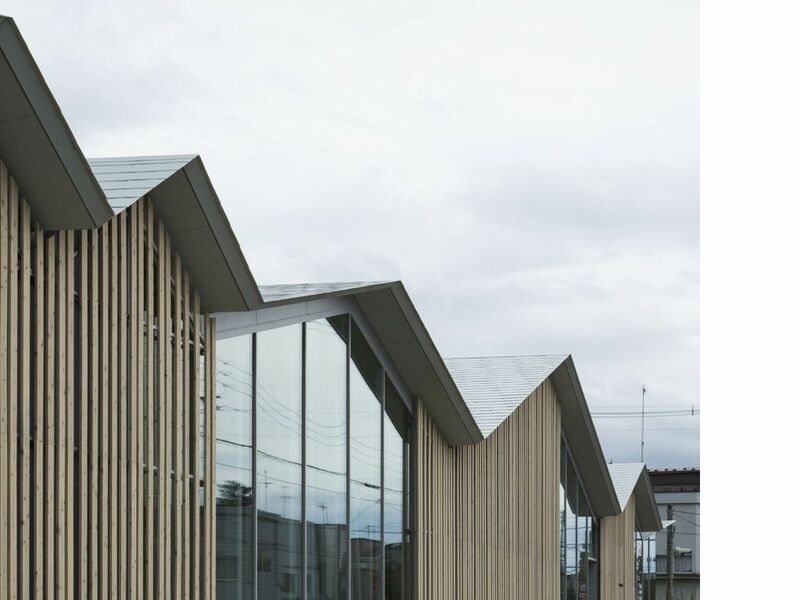 As in many of Kuma’s projects, wood is the key to the vocabulary of his poetics, and it is also found in the solid cedar boards that alternate with the windows covering parts of the walls of Towada City Plaza, offering visual shelter and protecting the interiors from the sun’s rays.